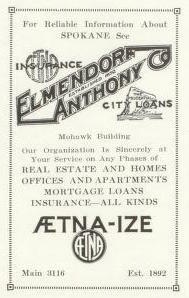 For reliable information about Spokane, See Elmendorf Anthony - Insurance & City Loans Our organization is sincerely at your service on any phases of real estate and homes, offices and apartments, mortgage loans, insurance - all kinds. Aetna-Ize. Mail 3116. Est. 1892.